Based on reviews from 6 experts and 715 users. 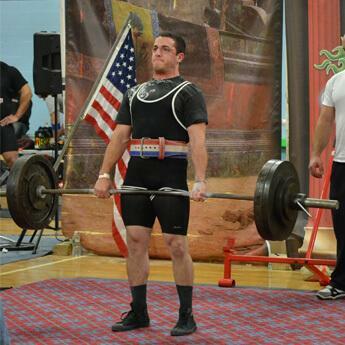 Learn how our rankings work or see our guide to Jordan training shoes. Updated Apr 2019. When you see shoes with the Jumpman logo on them, you immediately think “basketball.” And it is no surprise given that the person depicted in it is NBA’s all-time greatest player, Michael Jordan. In 1984, Nike designers Tinker Hatfield, Peter Moore, and Bruce Kilgore created the legendary Air Jordan I shoe exclusively for Michael. The trainer’s instant success soon led to the establishment of the Jordan brand. Now that it’s been more than 30 years since its introduction, the brand has evolved immensely. It has gained a significant weight in both basketball scene and the streetwear culture. Its popularity has not decreased even after the retirement of His Airness in 2003. Along with the brand’s sought-after basketball shoes and casual sneakers, it has also expanded to produce workout footwear. 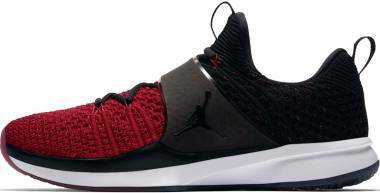 Even though there aren’t many Jordan training shoes available on the market today, these models are worth considering whether you are a long-time Jordan fan or not. Jordan workout shoes are crafted to meet whatever training needs an athlete may have off the court. Be it a gym session or any other cross-training activity that helps to improve the overall physical form, these shoes are ready to serve. Though a bit shadowed by their more popular siblings, Jordan trainers still carry certain uniqueness in the way they are designed. 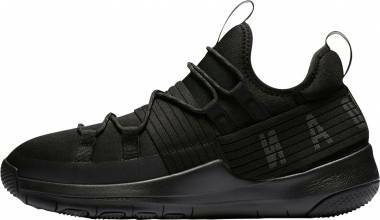 Unlike Jordan basketball shoes, these cross-trainers are made with a variety of different activities in mind which determines the kind of silhouette, cushioning, and support they have. This aspect of Jordan workout shoes has been heavily influenced by the famous original Air Jordan basketball shoe line. For example, the Jordan Traimer Prime was described as “the Air Jordan 12 that you can work out in.” But what’s curious is that the more recent models of Jordan training shoes have inherited less and less from the originals in favor of a more streamlined look of a typical workout shoe. And the fact that the Jumpman brand belongs to Nike makes it even more possible that its footwear design gets influenced by the popular Nike Metcon cross-trainers. 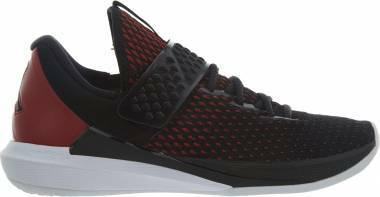 All training shoes from Jordan come with a low-cut upper to provide freedom of movement for the ankle. At the same time, some models feature an extended tongue and collar to keep the footwear securely on the foot. As for the materials, these shoes tend to use some sort of woven textile, including Flyweave, Flyknit, or Hyperweave to keep the upper breathable and flexible. Various synthetic overlays are also employed for added structure and protection in the high-wear areas. Finally, the foothold is completed by a combination of laces and a midfoot strap which offer an adjustable fit. 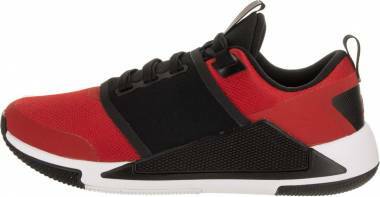 Just like most workout shoes, Jordan trainers utilize a low-profile midsole to help the wearer feel more in control of their movements and the surface. This cushioning unit is rather firm and is made of different foam compounds. Some of the examples include the Lunarlon (used in Jordan Trainer Prime) and the Phylon (found in Jordan Trainer 2 Flyknit, Jordan Relentless). They are created to be flexible and responsive to maintain the energy return upon each step or jump. 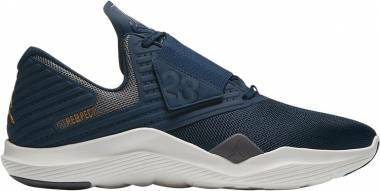 Some of the models also incorporate the Air Zoom technology for an enhanced rebound and shock absorption (Jordan Trainer 1 Low and Jordan Trainer 3). In most shoes, the midsole protrudes upwards to form a wall on the lateral side. It is meant to add stability during side-to-side movements and prevent the foot from rolling over the edge of the sole. There is no uniform design for the outer side of the sole among Jordan trainers. Each new model sports a completely different lug pattern, sometimes making use of Nike’s proprietary Tri-Star pattern for better multi-directional flexibility. However, each variation is made of a durable rubber compound and is meant to provide traction on various training surfaces. Note! The brand typically releases a new edition of the Jordan Trainer line around June/July. The most recent model is the Jordan Trainer 3 which arrived in July 2018. How do Jordan training shoes fit? These trainers are meant to fit just like any other workout shoe: it should be snug at the heel and the midfoot but feel a bit more spacious in the forefoot. These shoes are offered in a wide range of men’s full and half sizes to accommodate all sorts of foot lengths, from US 7 to 18. They tend to run true to size. Widthwise, they are only available in a standard D - Medium profile. The laces and the midfoot straps are placed on each model to make the tightness more adjustable. A pair of newly released Jordans will cost you from $100 to $140, depending on the model. However, during sales, there is a chance to grab one for as low as $60. Where to buy Jordan workout shoes? If you haven’t found Jordan shoes in any of your local brick-and-mortar stores, then purchasing online is the best option. You can order a pair from the official Nike website as well as from an array of trusted online retails, such as Amazon, Eastbay, Foot Locker, Champ Sports, Kicks USA, etc. Can I use Jordan trainers for running? Yes, but preferably not for long-distance running or marathon training. While they may have ample cushioning, their overall design is not suited for serious running. You can opt for a pair of Jordan running shoes but be prepared that the choice is very limited. Are there any Jordan training shoes for women? No. The Jordan brand has mostly been focused on producing shoes specifically for men and thus, none of the current workout models cater to a female foot. However, there is a selection of ladies’ Jordan sneakers as well as basketball shoes. ...that number 23 found on different parts of Jordan trainers represent Michael Jordan’s jersey number from when he was a professional basketball player?